Peak Energy: Can geothermal industry gather steam in Canada ? Can geothermal industry gather steam in Canada ? The Globe and Mail has an article looking at the prospects for geothermal power in Canada - Can geothermal industry gather steam in Canada?. But where many other countries have well-developed geothermal industries, Canada has yet to open a commercial plant. One roadblock is that most provinces and territories don’t even allow geothermal projects. Also, because geothermal is relatively expensive to develop and there’s no domestic production, investors remain hesitant to commit. “What we’re up against is getting the first successful project up and running,” says Tim Weis, Edmonton-based director of renewable energy and efficiency policy at the non-profit Pembina Institute. Alison Thompson, founder and chair of Calgary-based industry group the Canadian Geothermal Energy Association (CanGEA), wants governments to step in and help the industry gather steam. “There’s what we call an artificial border at the 49th parallel,” Ms. Thompson says. “The resource doesn’t end; there’s policies in place in our country that are preventing it from going forward.” CanGEA estimates that Canada could have 5,000 megawatts of installed geothermal power by 2025. 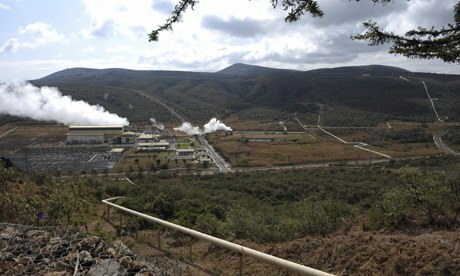 One place geothermal power is thriving is East Africa - The Guardian has an update - Kenya's energy revolution: full steam ahead for geothermal power. East Africa is undergoing an energy revolution driven by massive offshore natural gas finds in Tanzania and notable oil discoveries in Kenya and Uganda, all in the past three years. 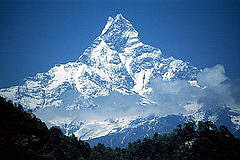 Energy from these hydrocarbons is yet to be realised, however. The domestic shortfall is a major hindrance to growth, leaving millions of people literally living in the dark. About 16% of Kenya's population has access to electricity, according to World Bank data, and demand is outstripping supply. Rationing is a daily reality for many. "The [national grid] service is unreliable and costs business owners large amounts in backup infrastructure and fuel," says Harrison Leaf, managing director of access:energy. Several private companies like Leaf's are developing off-grid micro-solutions to supplement national supply. But geothermal has become the darling of on-grid solutions for Kenya, and plenty of other countries are keen to benefit. Kenya's state-owned power producer, Kengen, has been asked to provide consultancy services to Sudan, Rwanda and Tanzania. According to the Geothermal Energy Association, Kenya will become the world leader if its planned projects are completed on time. The country has set the ambitious target of producing 5,000 megawatts (MW) by 2030, which will power millions of homes: all energy generated is fed into the national grid to increase the percentage of households served. The World Bank estimates that geothermal from east Africa's Rift Valley could power 150m homes. Progress is steaming ahead at the country's largest geothermal site, 80km north-west of Nairobi. Kirimi has lost count of how many wells he has drilled. His eight rigs with giant cylindrical shafts and diamond teeth are drilling wells at a rate of more than 40 a year. One well has the power to produce 18MW annually; by July 2014, Kirimi hopes to be generating 280MW – and working towards the site's next target of 560MW.